These silver flowers that sway in the breeze are pretty charming. Sweet and crispy on top, gooey inside. 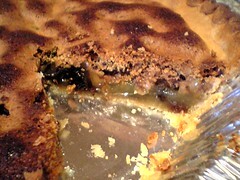 A squat apple pie made in an extra large muffin tin. It didn’t quite work, the bottoms leaked. I used the little pies in the foreground of this picture (Flickr) by Roboppy for inspiration. * I don’t know why my family spells it with a Z.
vegetarian and vegan thanksgiving recipes via lifehacker. I am not a vegetarian but I wanna try the nut roast. and look! 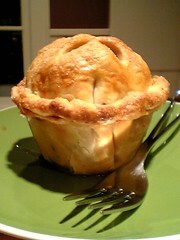 mini apple pies made in cupcake tins! Recipe for Scotch eggs (last picture, if you don’t know what you’re looking for) at The Hedonista. Recipe for gingerbread at Angry Chicken, it’s been too long since I’ve had gingerbread. Matt gets the egg and muffin toaster, declares it good and, dammit, now I want one. A primer on vanilla by David Lebowitz. My annual making of the family recipe Osgood pie is approaching and I found this little story about it’s history. Spam Cupcakes. No seriously, it’s a recipe on Hormel’s website. via Craft and Bake. A holiday gift guide for food types, at 101 Cookbooks. Mixed media – a few times this month things I know of online have appeared in other media, it’s always a little thrill. The ones I can remember – the Oct 2005 Readymade magazine has a small article on Cooking For Engineers*. Last week I was shocked to hear the voice of Pableaux Johnson, who I will always associate with SXSW, on the Splendid Table radio show (Sept. 24th) talking about New Orleans restaurants after the hurricane. * Of which most recently I found the Equipment and Gear page on kitchen knives to be so very helpful. I had been looking for this egg clacker for a while after it disappeared from the museum shops. CB2 has a magnetic pen cup, where have I seen that before? Of course, theirs is way sleeker. Accidental Hedonist tasting notes on pomelo, I first encountered these when living in San Francisco and fell in love with them, I couldn’t wait for them to appear in the markets in Chinatown. A while back Martha Stewart’s catalog had a teacup and saucer made out of barley candy which was right out of a fairy tale, or maybe Charlie and the Chocolate Factory. I found some like it at Timberlake Candies – they have a few sizes of barley candy teacup and saucer sets, and take a look at the barley candy mini spoon meant to sweeten and flavor a hot drink. The edible candy cane shot glasses are back at Urban Outfitters, we waited until they went on sale after Christmas last year and used them for New Years. update: Craft & Bake reports they can be found in the Target dollar bins, thanks! We also got the Rudolph set, complete with tree, on sale to use as an alternate to a nativity set. (Oh the emails I might get about that.) Also, take alook at the Charlie Brown Pathetic Tree. The travel finger puppet theater at Angry Chicken is so charming! It also makes me think of the Gnome & Garden kit, which is not really the same thing, but they share the postcard sized changing background. Evany’s search for the replacement of the perfect bag has come to a happy ending. Cinnamon, who makes bags at Poise recreated the original, and soon we’ll be able to get our very own, yay. I’ve found out it’s been discontinued by the manufacturer but I’m hoping some shop, or somebody, out there might be selling a few yards, or perhaps more. I’ll continue to search online but if you just happen to see some innocently sitting on a store shelf somewhere I’d be super grateful if you’d let me know. My deep, and slightly panicked, thanks. We arrived at the Urban Craft Uprising around 1:45 and the place was packed. It was a good space with plenty of light. It was a fight to get around to each vendor, but well worth it. Everything there was fabulous. Congratulations to everybody involved, I hope there will be more to come. and life size donut paintings! PDX Super Crafty was there, with stacks of their new book. Yummy soft yarn from Glamscience, if you knit also check out her glittery goods for knitters. I love chestnuts but I have found the struggle to get them out of the shells frustrating before. Last night I followed these direction for roasting and peeling chestnuts by Sally Schneider via The Splendid Table and found it much easier to get the little suckers out, and the skins came off easily. If you cannot grab the skins I found gently squeezing the chestnut broke the skins enough to get a hold. See also these faster, but more involved, instructions for peeling chestnuts from Jacques Torres via Martha Stewart. Next we’re going to make roasted Brussels sprouts with chestnuts. I never liked Brussels sprouts until I had them roasted like this, now I look forward to them.